Sony's super compact ruggedized action camera gets a radical update with the arrival of the RX0 II. The crucial difference between this waterproof camera from its predecessor is the addition with a fold-up 'selfie' screen – which will appeal to vloggers and for those creating a family album. It's expensive compared to its rivals, but the RX0 II could be the best action camera for overall image quality. The main specification of the RX0 II (or the DSC-RX0M2 to give it its full model number) otherwise stays much the same. The 15.3MP one-inch sensor is designed to offer 4K video shooting. The lens is a fixed Zeiss Tessar 7.9mm - which gives the equivalent wide-angle focal length of 24mm. Measuring just 59 x 40.5 x 35mm and weighing just 132g, the RX0 II is small enough to fit in your pocket and is designed for an adventurous outdoor life. It is waterproof down to 10 metres, is dustproof, is shockproof enough to withstand a fall of 2m, and is crushproofed so as to withstand a 200kg force. Launched in 2017, the original RX0 could shoot 4K - but in order to do this it needed to be connected to an external recorder (such as an Atomos Ninja). The RX0 II gets rid of this Heath Robinson arrangement and offers you 4K shooting at 3840 x 2160 resolution at 30p. A super-slow motion mode is still available that allows you to shoot at 960fps or 1000fps (depending whether you are using the American NTSC standard, or the British PAL system). Stills can be shot in burst mode at up to 16 frames per second, and there is a top shutter speed of 1/32,000sec. Another welcome addition is a built-in electronic SteadyShot image stabilizer – which helps to make handheld movie shooting that bit smoother. The LCD measures just 1.5in across with a 230,400 dot TFT display – but its new party piece is that this can be tilted upwards through 180° to enable the screen to face forwards, so that you can use this to frame yourself for selfies or for serious vlogging. The screen can also be tilted downwards through 90° for overhead shooting, or to reduce glare. It is this tiltable screen that now makes this a very different to the GoPro market-leading range of action cameras. Other running improvements have also been made under the hood – with Sony claiming that the Eye AF system (which automatically locks focus onto the eye of your subject) has been significantly improved. 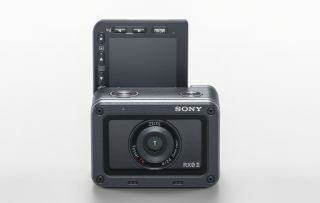 The Sony RX0 II will be sold in a kit with the VCT-SGR1 Shooting Grip and bracket and will go on sale in May 2019. The kit will retail for around £730/$800.